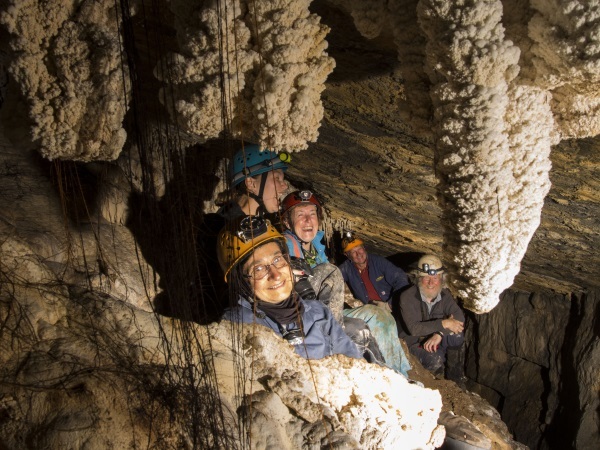 ← Finally, a Tassie canyon! 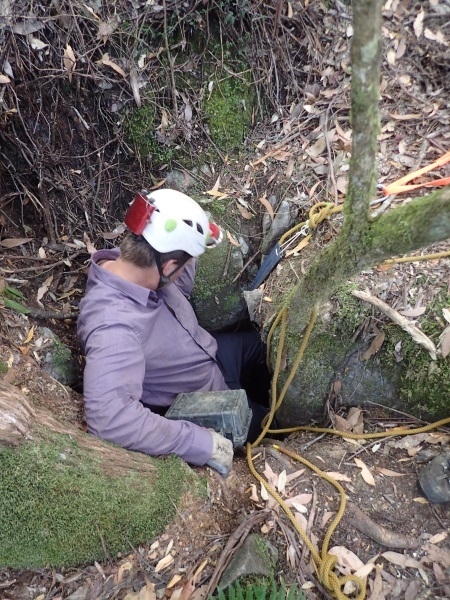 After the ASF Caving Conference in Devonport, a number of Post-Conference trips were offered, one of which was to Mt Cripps, a highly restricted area and there were only 8 people that would be accepted. Anna O-B and I were lucky enough to get spots on this trip and we headed off on the 5th after lunch. It was a long, long way to go, took a couple of hours to get there, the last part of the trip being on old fire trails and past two locked gates. 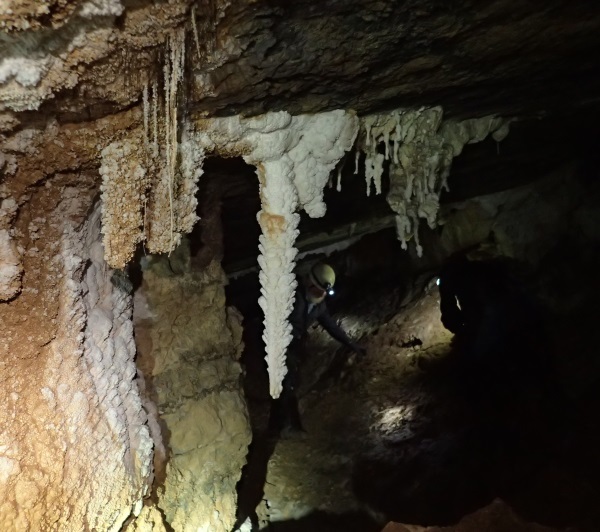 Eventually we arrived at the Cavers Hut. This was very “luxurious”, bunk room, sitting room and kitchen with a nice veranda where we could cook outside. There was a lovely pit toilet (with a view) and a bush shower, all very civilised. Only five out of the eight participants ended up coming (obviously they’d gotten a better offer), and our guides from Savage River Caving Club (SRCC) had set up some tents for us to use if we didn’t want to sleep in the hut. 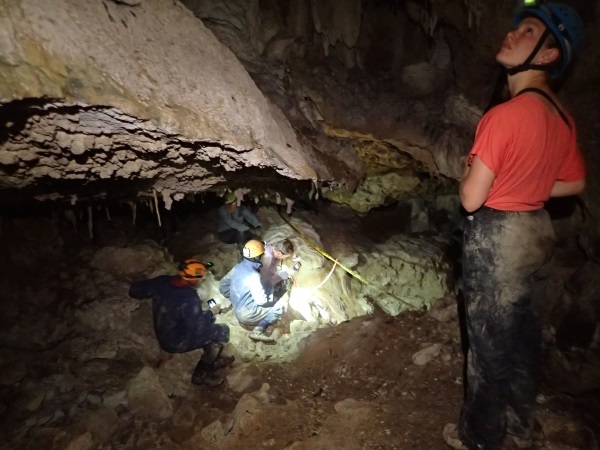 The SRCC members were amazing, they were so hospitable, and were a wealth of knowledge, not the mention plying us with happy hour treats and ice blocks at the end of each caving expedition. So, what’s so special about this area? 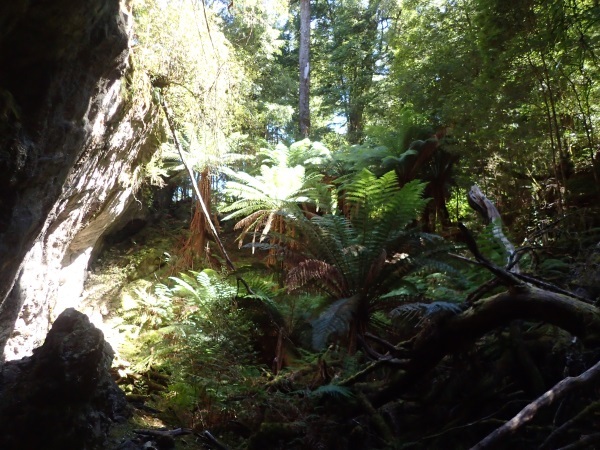 It’s the only area of karst with temperate rainforest covering in the whole of Australia. 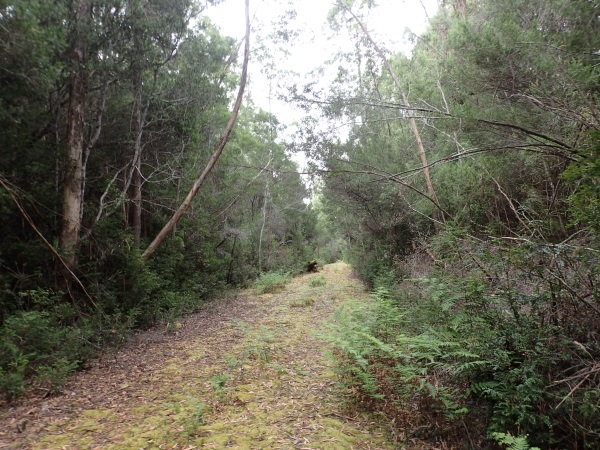 It’s situated in a nature reserve and is rarely visited as it’s considered a study area rather than a recreational area. This is the type of rainforest we were walking in, note the cut logs along the “track”, certainly made walking easier in the rainforest. A lot of the way though we were under the canopy and we were walking just on leaf litter amongst the trees. The SRCC has about 8 members, not very many, and they are all getting on in years. They regularly visit the karst area and are keeping the tracks maintained, as if you didn’t have tracks in this area it would be hard going. 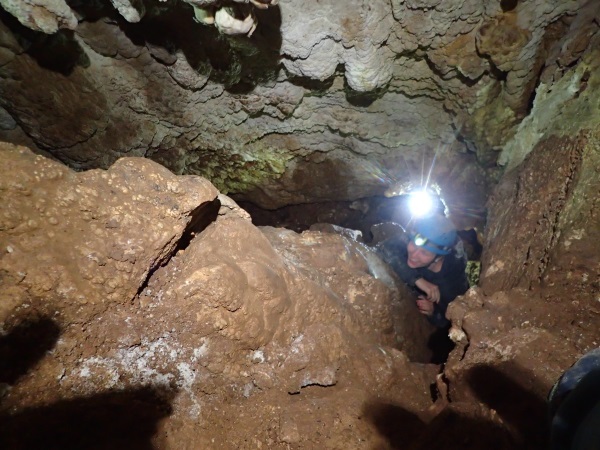 They are still finding new caves in the area, and noting them on a map for future generations. Track maintenance is a major job and the sad thing is that once the SRCC members are unable to do the track maintenance, then they will “walk away” from the area, as there are no younger members to take on the challenge. 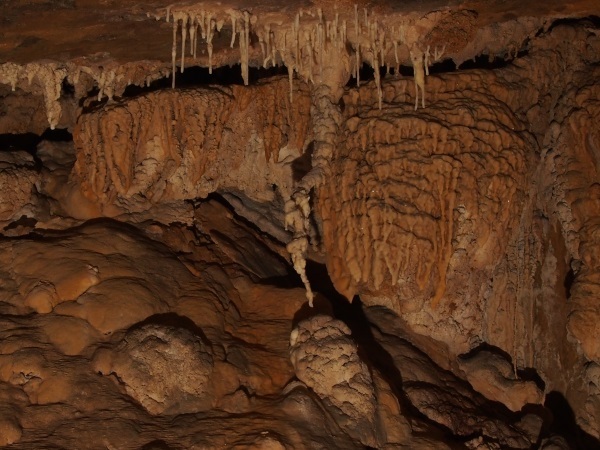 I felt very privileged to be visiting their caves! Note the foot placement holes that have been placed for getting over this big log, there were some on the other side too. This is the type of work SRCC do. 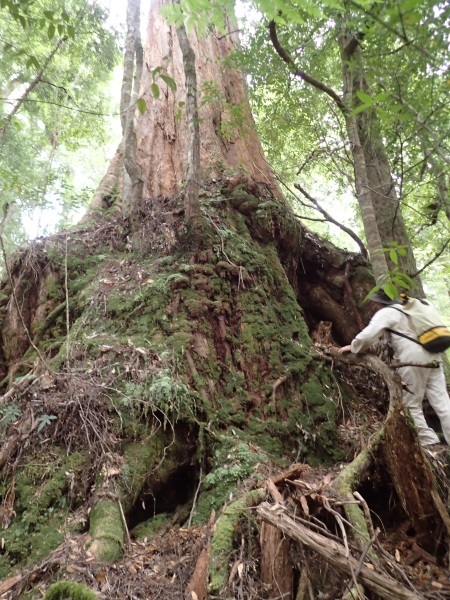 We visited the fattest tree in Tasmania; a Eucalyptus obliqua with a height of 60.9 m and diameter of 6.71 m and circumference is 21.08 m. This tree is about 300 years young and it has not lost its crown. 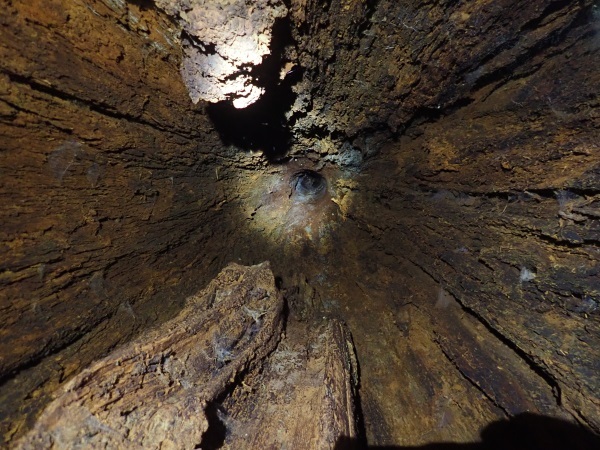 It is thought to be nearing the end of its life as the middle has rotted out and there are long cracks travelling some 25 m up its trunk. 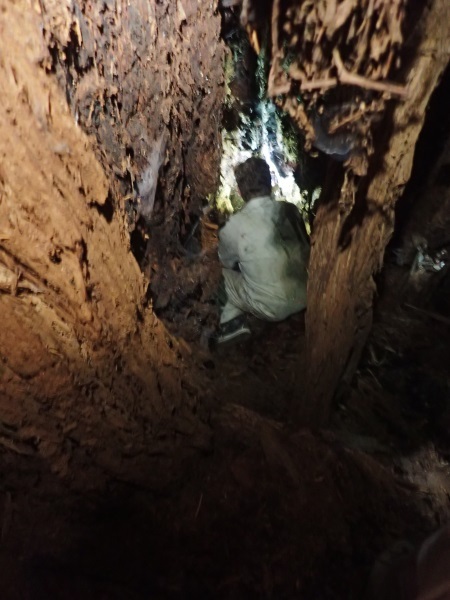 There are a couple of holes in the trunk (about 2m off the ground), so we climbed up and took a peek inside, Brett went further down, there were one too many spiders and cob-webs for me. 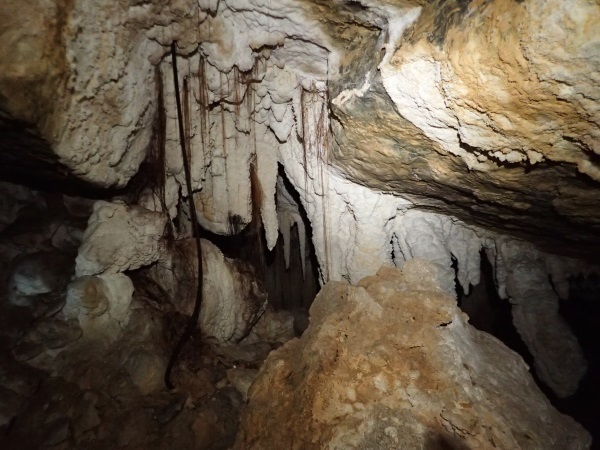 We then made our way to the cave for the day, Philrod Cave. 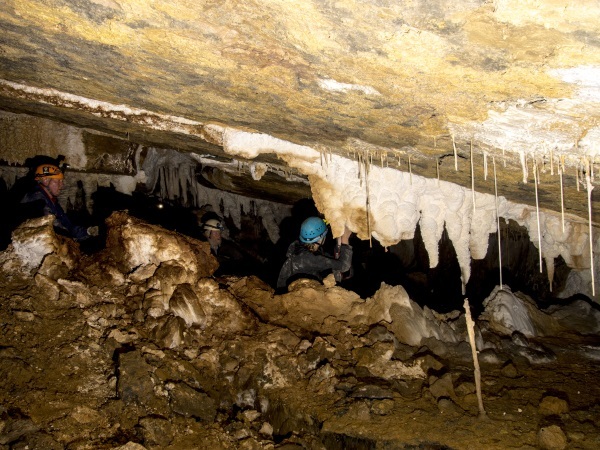 It is the largest cave with over 650m of passage and is well decorated. 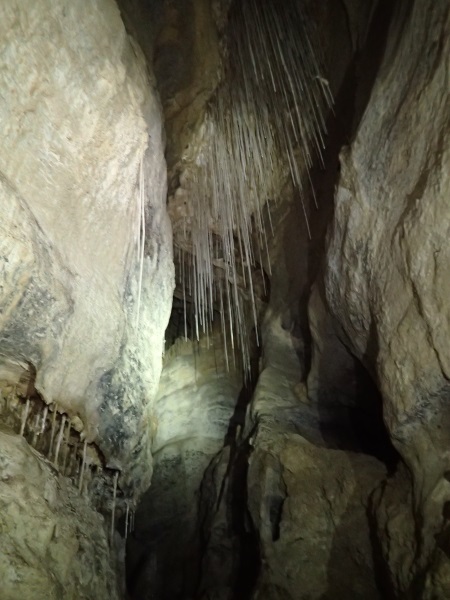 It’s a horizontal cave and has a straw hanging from the ceiling that measures 4.5m. You can only just see the 4.5m straw. On the way out we found this female Cave Spider with it’s egg sack. The spider toe to toe was about the size of my hand (they do get bigger believe it or not!). There’s a great full length feature film out called Sixteen Legs which details the sexual life of these spiders, really, really good. We sat and had lunch and then Steph wandered off to “spend a penny” and came back to say she’d found another cave … they are all over the place here. 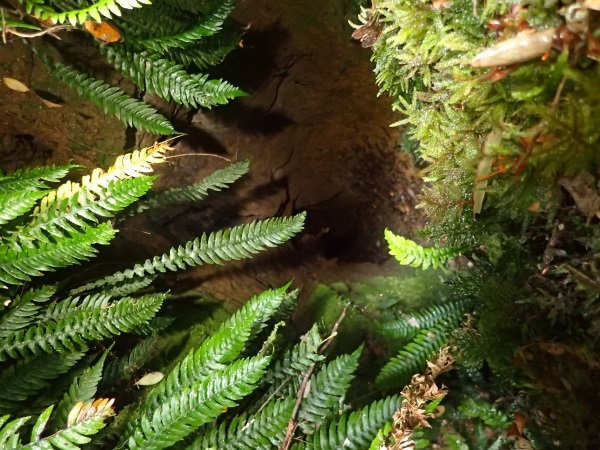 We took a look at it, a vertical shaft with a hole in the bottom. 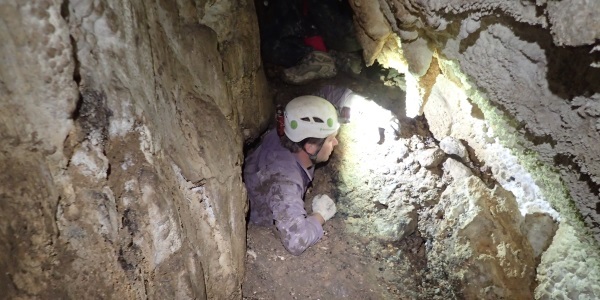 It would be dead easy to get down but getting into the hole to see where it went would be challenging. We called it Wee Cavette (in honour of Steph). 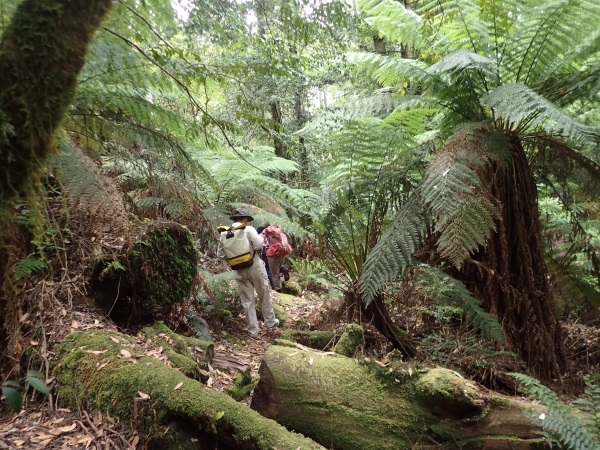 We then followed the leader through magnificent rainforest areas, so easy to walk through. 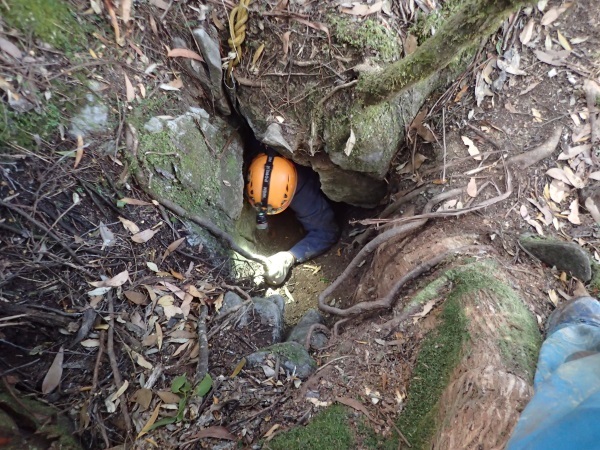 We took a quick trip down Dead End Den cave which involved a squeeze between the tree and the rockface, the best part of it I think was getting in and out! 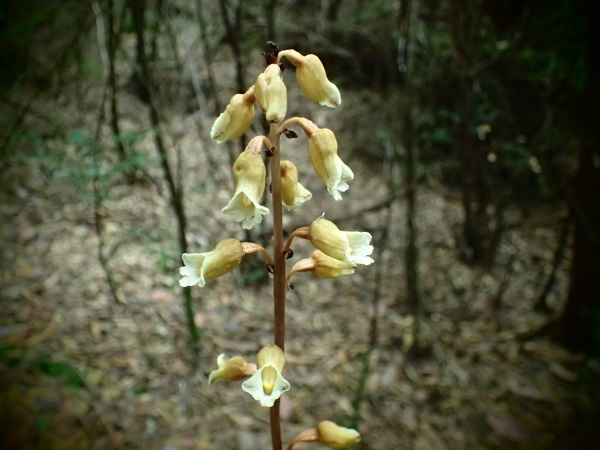 On the way back to the hut we came across a Potato Orchid Gastrodia sesamoides, the stem was about 50cm high with flowers all around it (it can have up to 25 flowers on the one stem), no leaves to speak of down at ground level. The track back to the hut, easy walking! 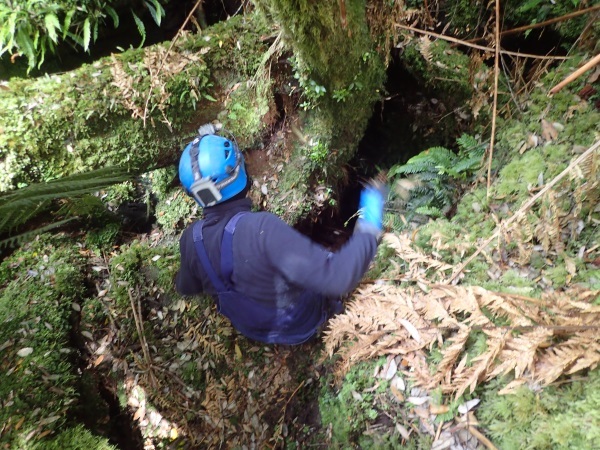 Next morning we headed out for Gum Pot Cave, which involved entering through a small hole and then going down a leaf-littered slope, the rope was used to control the slide down the slope and to use as a hand-hold to get back out. More decoration, you can see Paul and Brett in the background – there was a gaping chasm to the left – looked like 10m but probably wasn’t that deep. To get to where some of the good decoration was, you had to step across a muddy slope. After the first muddy slope, I decided that falling to almost certain death wasn’t such a good idea, so I stayed back while Brett, Anna and Hanna went on. They weren’t gone long, there mustn’t have been that much to see. Anna (or maybe Hanna) coming out of the hole, it was really, really awkward. By this time we were popping down every hole that we came across, and not finding much but it was still fun! This one had a few scrambles in it. 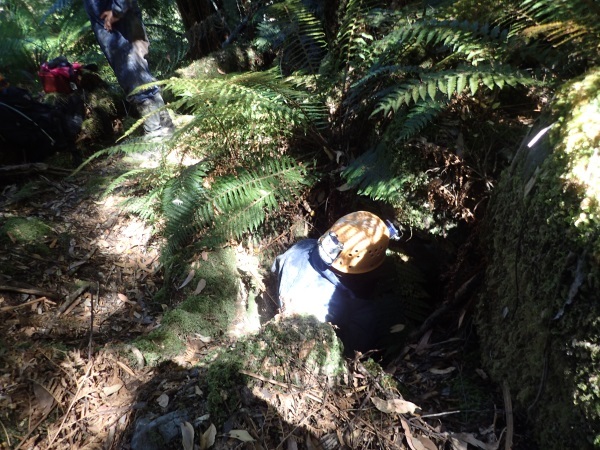 And a hole that Brett went down, didn’t find much after the hole though. From here we were given the option to go to another cave, or head straight back up. We (of course) opted for another cave. What we didn’t realise was that we’d be walking out of the rainforest area and into an area that had been burned in a significant bushfire. 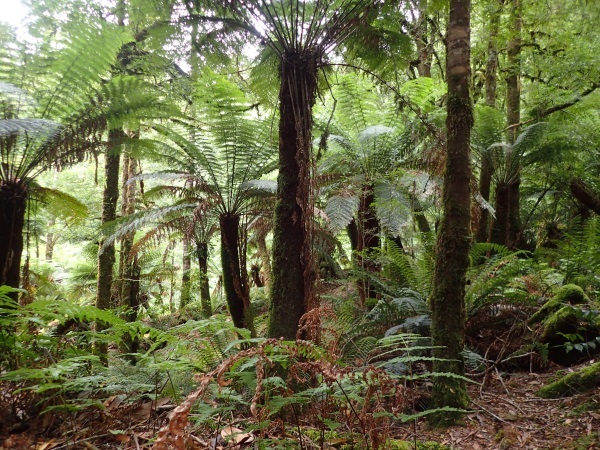 So, the canopy of the forest had been burned, a lot of trees had fallen down and with all the sun, a mass of ferns and sword grass had flourished. Walking through this ferny/grassy area wasn’t the best idea, plenty of opportunity to fall down holes and trip over logs. Didn’t last long though, but it was very hot in the sun. 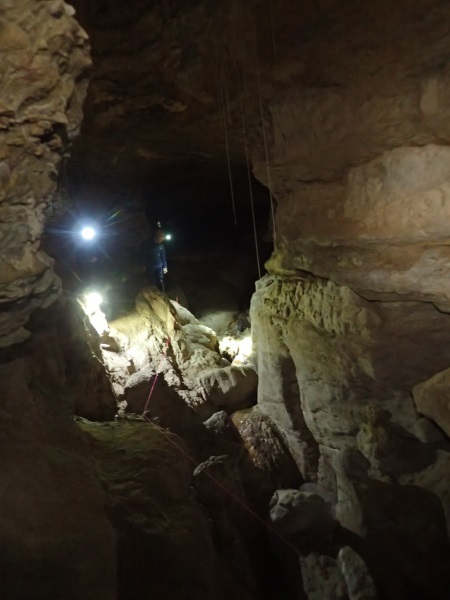 Eventually we were back in the rainforest and arrived at our destination, Xerxes cave that’s on the front of the Mt Cripps Field Guide. This was an interesting cave because it was one that was in the side of a cliff. It’s very short, but has decoration in it. 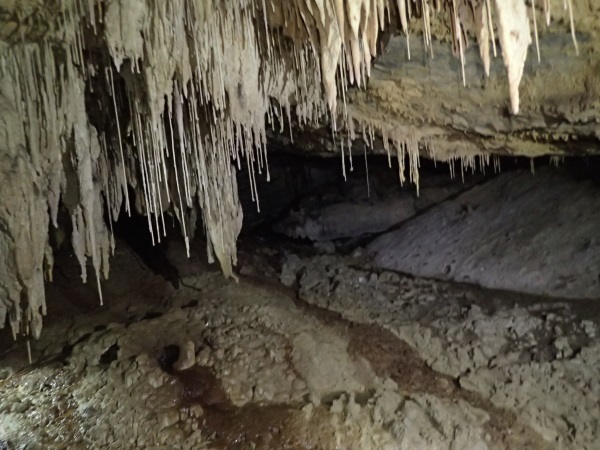 The cave ends at a roped off area, specifically to keep people out, there’s not much further that they can go but it’s down a muddy bank and you can see all you need to see, so what you can see is being protected. The decoration you can see from the barrier, there is a small lake there too, the level of which fluctuates. 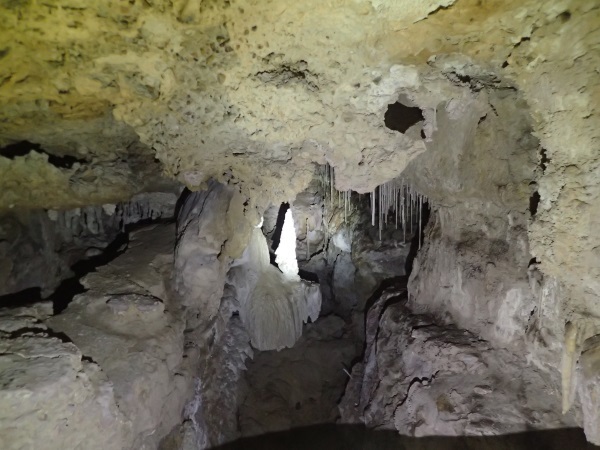 After this cave, we headed back up the hill (a hot slog) and were soon back at the trail and the hut. 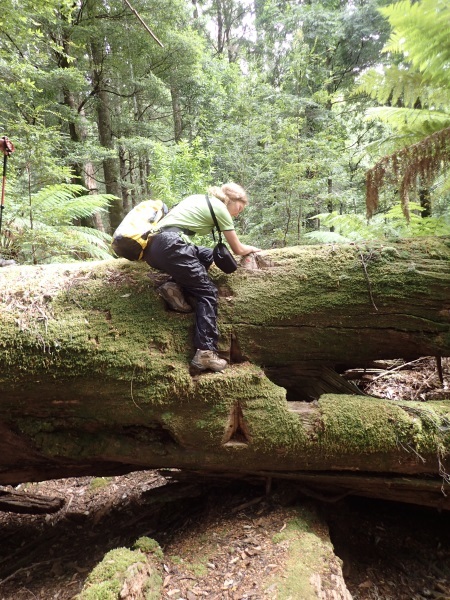 We quickly cleaned up and helped put stuff away, and then Anna and I were on our way to Mole Creek for three weeks of caving there. Thanks so much to the members of SRCC for sharing this special area with us, I felt privileged to be able to visit the area with them. 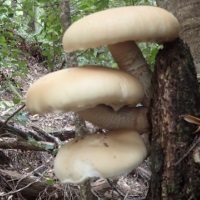 Thumbnail: The area is famous for fungus, we didn’t see much but I did spy this spectacular one. 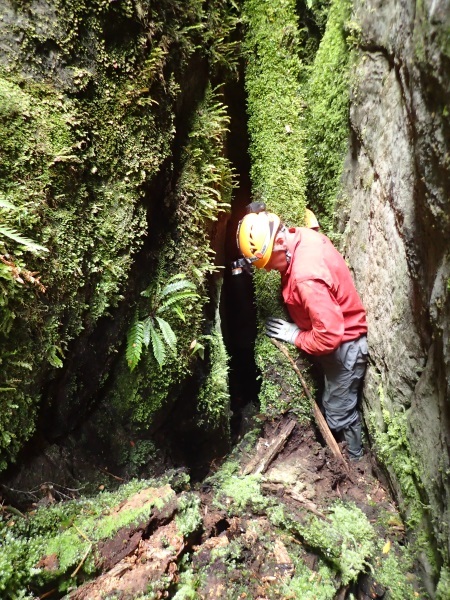 This entry was posted in Caving, Tasmania. Bookmark the permalink.